The first Milton Keynes Marathon was held in April 2012. It is notable for being very green and scenic while inside the city limits.Consistently ranked in the top 10 UK marathons, an AIMS/IAAF Grade A certified race, with BARR Gold accreditation for outstanding race management and an amazing stadium MK finish. 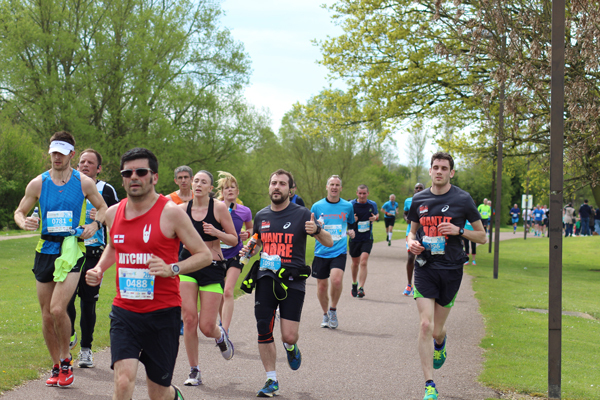 The MK Marathon starts from one of our fabulous Milton Keynes landmarks, the stadium MK. The first five miles are on wide roads and tree lined boulevards, giving runners a chance to soak up the atmosphere and enjoy some enthusiastic spectator support. Consistently ranked in the top 10 UK marathons, an AIMS/IAAF Grade A certified race, with BARR Gold accreditation for outstanding race management and an amazing stadium MK finish. The marathon route then continues through picturesque Woughton-on-the-Green and Woolstone parishes, where the half marathoners split from the full marathon course at mile seven. 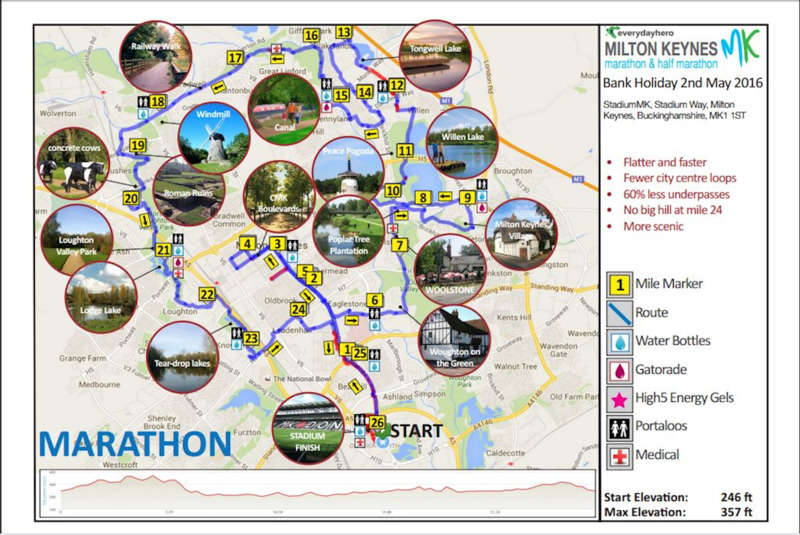 The marathon runners continue through the original Milton Keynes Village, renowned for it’s picture postcard thatched cottages and then on to enjoy the beauty of Willen Lake and the tranquility of the Peace Pagoda before looping back to join the meandering and historic grand union canal. The route will then take in St Andrews, a 13thCentury church, before passing the Bradwell Windmill, built in 1810 at around mile 18. The route continues west to Bancroft where it passes the remains of an ancient Roman Villa. Runners will then head south, following the brook, passing the famous Concrete Cows and then Bradwell Abbey, built in the 14th century. The route follows the brook further south,through the fertile Loughton Valley Park, passing Lodge Lake and then Teardrop Lakes before heading back for a victory lap of the stadium MK football pitch and that magical stadium finish! The majority of the MK Marathon route is incredibly green and scenic. It includes beautiful parks and lakes, picturesque villages and the canal towpath, and offers a truly spectacular experience for our runners.